“Diversity is not a burden to be endured, but an opportunity to be welcomed,” said Melia Belli, Associate Professor of South Asian art history at the University of Victoria, in her opening remarks. 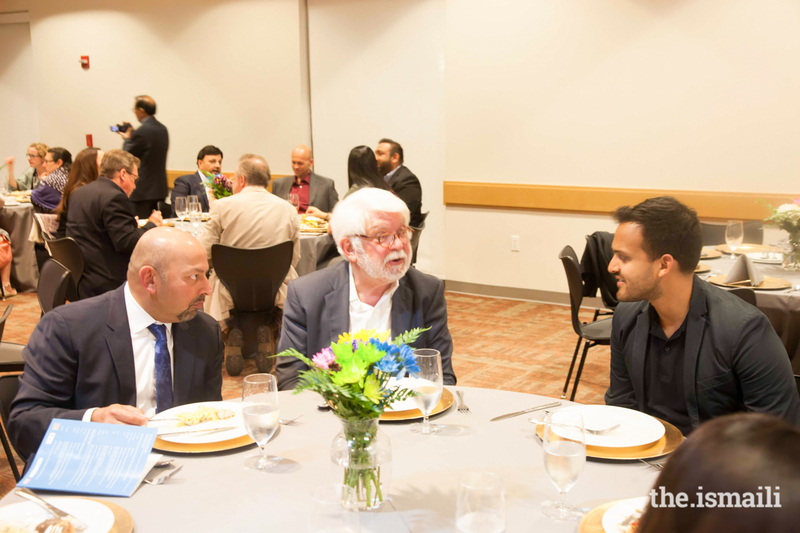 The occasion was the Islamic Art Symposium entitled “Intersections: Visual Cultures of Islamic Cosmopolitanism,” held at the Dallas Museum of Art between May 4-5. It was cosponsored with the Edith O’Donnell Institute of Art History, Islamic Art Revival Series, and the Aga Khan Council for the Central United States. The academic symposium sought to investigate art of various media arising from contact between Islamic and non-Islamic societies. Reflecting the theme, Ms. Belli added, “A cosmopolitan society regards the distinctive threads of our particular identities as elements that bring beauty to the larger social fabric.” Artists, art enthusiasts, and academics gathered to consider artworks from the eighth century to the present, and to engage in meaningful dialogue on interculturalism. Prof. Jonathan Bloom in discussion at the dinner at Plano Jamatkhana. Walker, a Harvard alumna, was involved with the Aga Khan Program in Islamic Architecture while studying Byzantine art in graduate school. She finds Hazar Imam’s projects integral to the work she is doing now, almost twenty years later. During the Symposium, she spoke on the subject of cross-cultural artistic interaction while on a panel for "Islam, Art, & The Medieval World." Walker used this realization to fuel the project which she presented at the symposium. Her research discussed how connections to the Islamic world are integral to understanding the ideologies of power in Byzantium. On the second day, the symposium moved to the Horchow Auditorium at the Dallas Museum of Art and included further discussion as well as a tour of the Keir Collection at the Dallas Museum of Art. Among the speakers was Jason Moriyama, a lead design partner for Moriyama and Teshima Architects. In 2010, the firm was awarded the Aga Khan Award for Architecture for its work on the Wadi Hanifah environmental restoration project in Riyadh, Saudi Arabia. Recently, the firm was charged with designing the Aga Khan Museum and the Delegation of the Ismaili Imamat in Canada. At the Symposium, Moriyama channeled his experiences and gave an opening address on architectural intersections. Like Moriyama, Professor Azra Akšamija found immense value in the different levels of engagement. The Islamic cemetery in Austria that won a 2013 Aga Khan Award for Architecture included her design for the Qibla wall-curtain and rugs for the prayer room. Constructed of local materials in the context of local craft traditions, the Qibla draws on motifs of Islamic religious architecture, symbolically uniting the cultures of the region. The prayer rugs, stylistically in dialogue with the Qibla, were woven by women survivors of the war in Bosnia. This effort took nine years to mediate and required the collaborative effort of the Jewish, Catholic, and 95 different Muslim communities scattered across Austria. Because of her past experience with building bridges between local traditions, she found the lens through which the symposium was constructed—cosmopolitanism—to be a fruitful one. That evening, Shahzia Sikander, the first woman to teach Miniature Painting at the National College of Arts in Lahore gave the keynote address on multiculturalism. The night concluded with a reception at Plano Jamatkhana consisting of a formal dinner and a performance by the Ismaili Youth Choir. The reception also paid tribute to several Jubilee Arts participants, including Neelima Saha. Her collection, entitled “Beadiful,” showcased a variety of handmade necklaces, bracelets, earrings, and tasbihs. Like many present, Neelima felt that she benefited from the exposure and was inspired to continue to grow in her craft and pursue other forms of the arts. “I went there to go and display my artwork but I came back with a lot of connections, a lot of friends, and a lot of experience,” she said,“Rather than just displaying my stuff, I learned a thousand times more.” Neelima befriended painters and musicians who helped her think outside the box and experiment with different mediums. Because of these interactions, she felt more unity and kinship with the Jamat and especially her fellow creatives. “Art, architecture, and music are forces that build connections and are powerful avenues through which to understand our shared humanity, especially when faced with societal fragmentation,” said Salim Rahimi, Honorary Secretary of the Aga Khan Council for the Central United States, in his address, emphasizing the importance of using art as a way to connect with others on a larger scale.